Flamstead church is one of the most rewarding in Hertfordshire. Externally it's nothing out of the ordinary, but there are treasures waiting to be discovered inside. 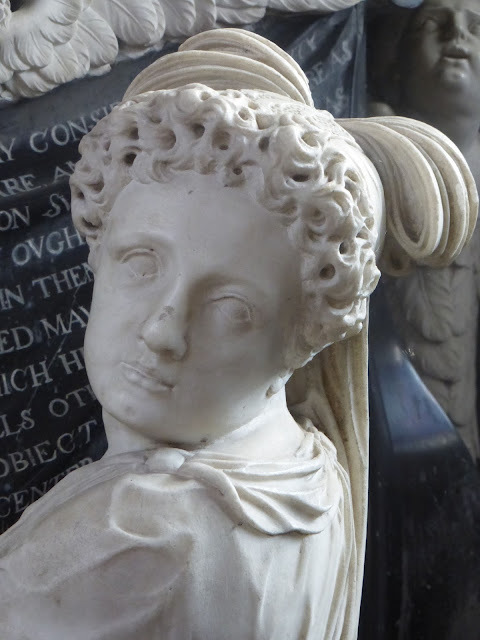 Chief among them is found at the east end of the south aisle, the Saunders monument of c.1690. I know of no other monument quite like it, and the originality of its conception is matched by the excellence of its execution. It deserves to be very much better known, as it's almost (but sadly not quite) a masterpiece of English 17th century sculpture. The architecture of the monument is standard enough. 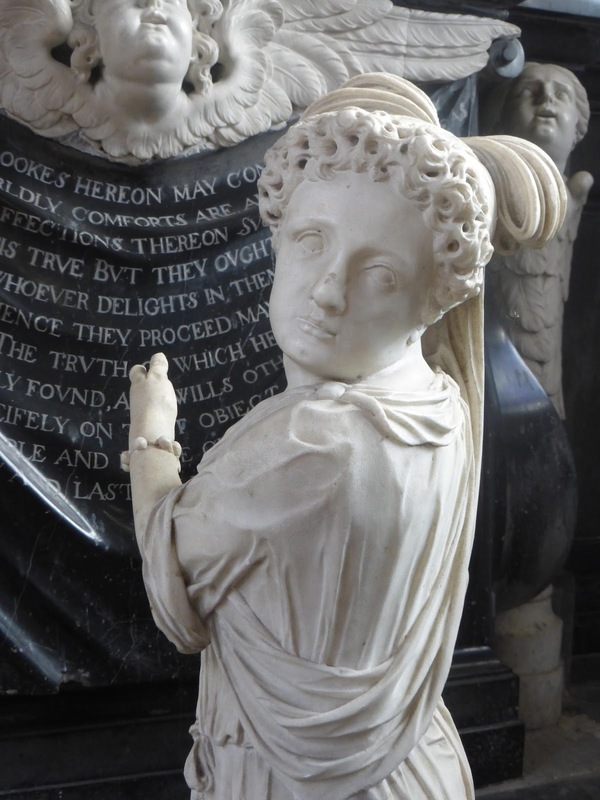 An altar-like shelf is supported by two elongated winged putti, and another winged putto holds a sheet on which is written an English inscription. 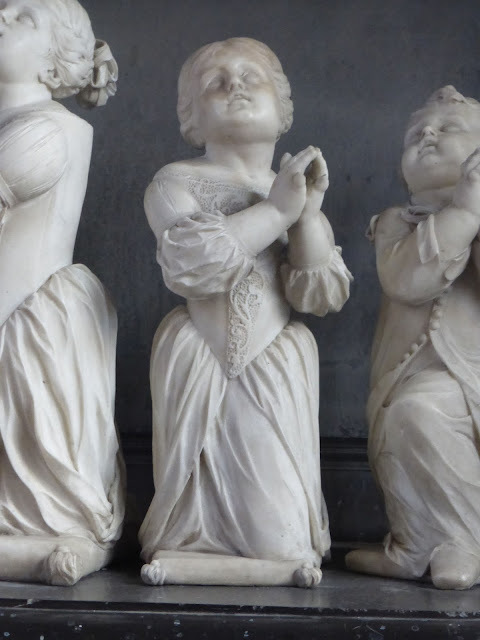 All three putti look up with expressions that could be read as hopeful, expectant or awed. 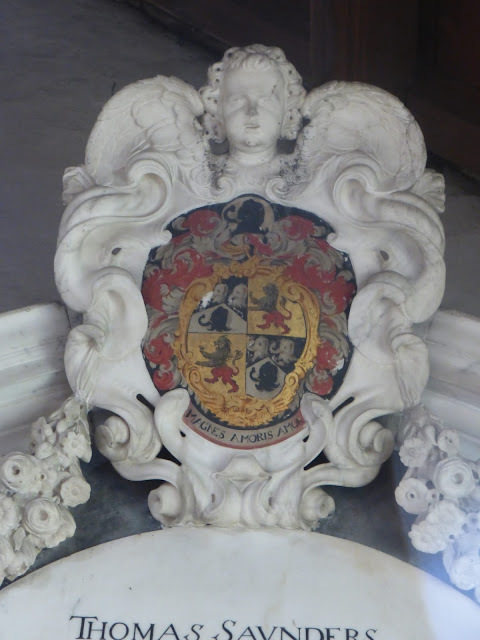 From the altar rise two ionic columns which support a segmental pediment and the usual heraldic achievement and swags. 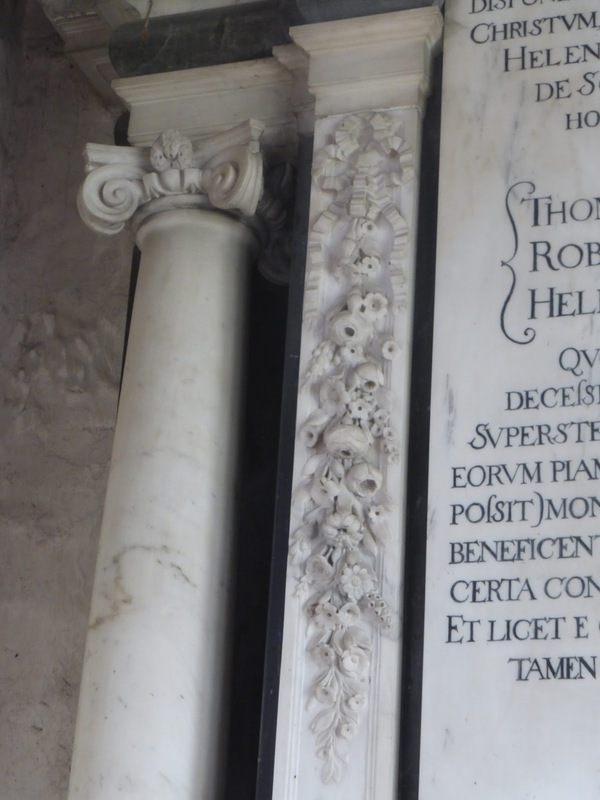 Inside the columns are two pilasters flanking a Latin inscription. All this is, as I say, routine (though I particularly like the fruit and flowers on the pilasters); there are hundreds if not thousands of monuments that follow this formula. But what makes this monument special are the six figure sculptures for which the architecture forms a theatrical backdrop. 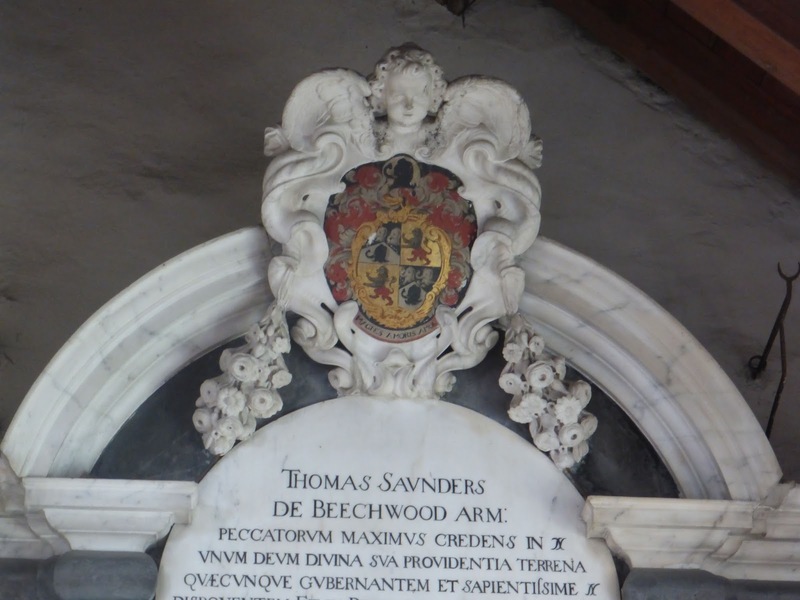 The Latin inscription informs us that Thomas and Helen Saunders had six children (though no dates are given), and that all but one of them predeceased their parents. 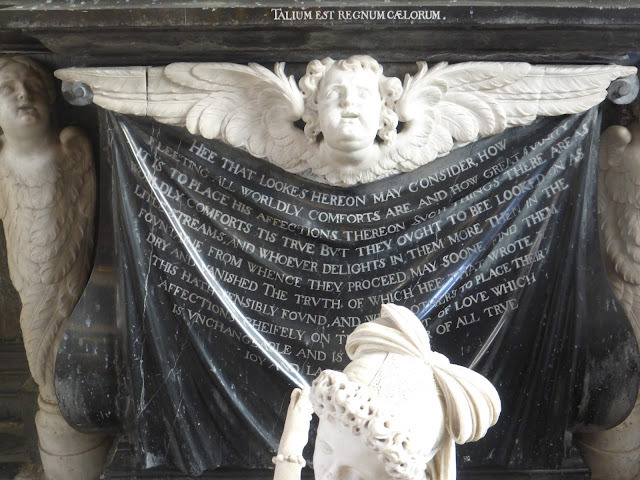 Let's pause here to ponder the beginning of the English inscription: 'Hee that lookes hereon may consider how fleeting all worldly comforts are and how great a vanity it is to place his affections thereon.' These words are written as if by the grieving father (though he could have commissioned them from someone else); his attempt to cope with his feelings is powerfully moving. He tries to rationalise away his desolation at having lost five children by trying to persuade the reader (and himself) that they should 'place their affections cheifely on that object of love which is unchangeable' (i.e. God). But I'm far from convinced that he (or his wife) submitted to what they took to be God's will with such dispassionate stoicism*. 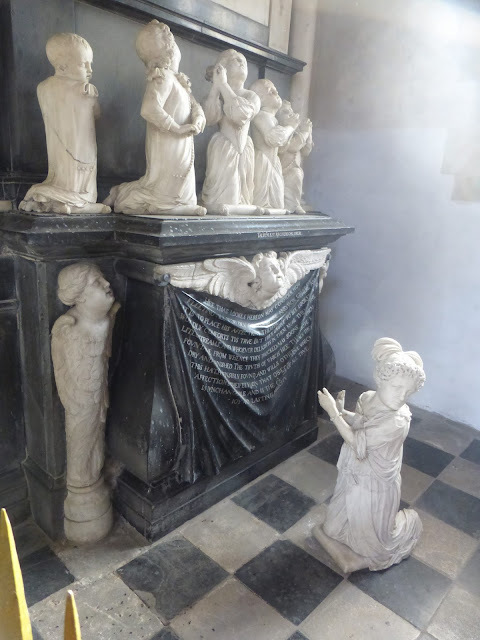 The five dead children kneel on the altar. They range in age from the son on the left who seems to be round about a year old, to the brother and sister, second and third from the left, who could be about five, or maybe older. (We don't know when the children died, nor do we know if they're depicted at the age at which they died.) 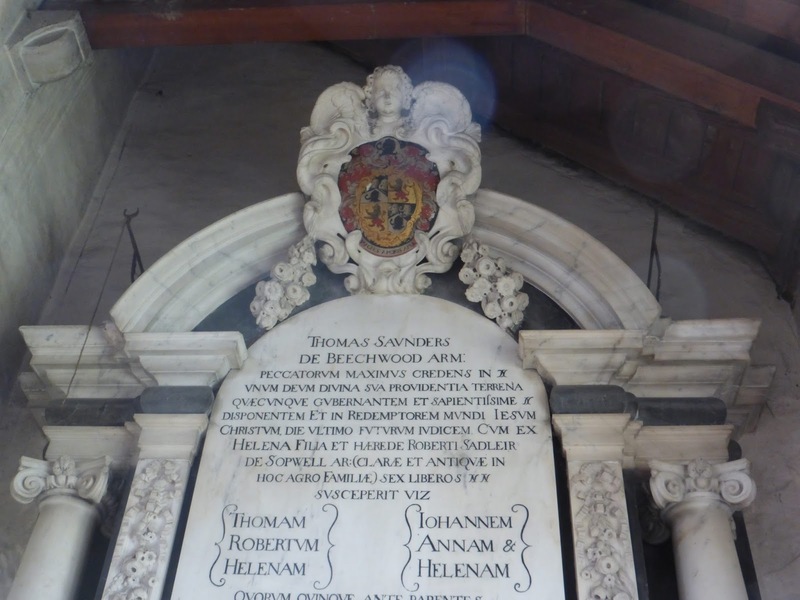 I believe them to be, from left to right: Thomas, born 1661, Robert, born 1662, Helen, born June 10 1668, Helena, born c.1664, and John, born April 26 1669**. 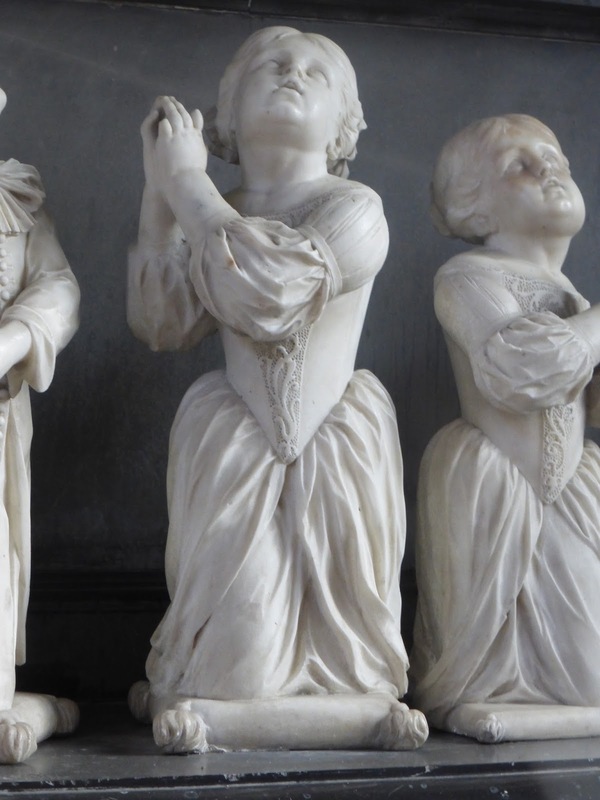 The other four children all look up to Heaven with expressions not unlike those of the putti beneath them. 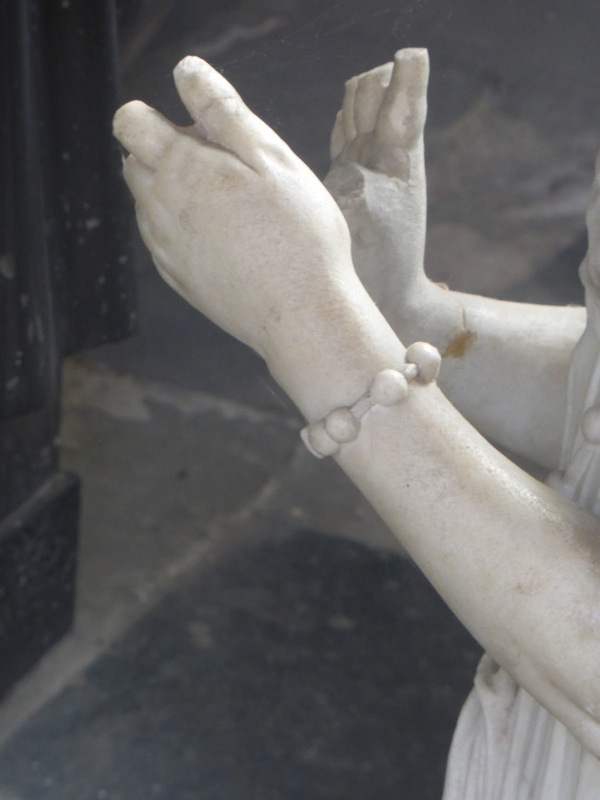 They're all praying (somewhat ostentatiously) with their hands except Robert; instead he holds them at his side, or could even be wringing them. He also has the most neutral facial expression; these two details single him out as the most composed of the five. They all kneel on both knees, except John, who kneels on just one. These little differences help to animate the otherwise potentially static array. 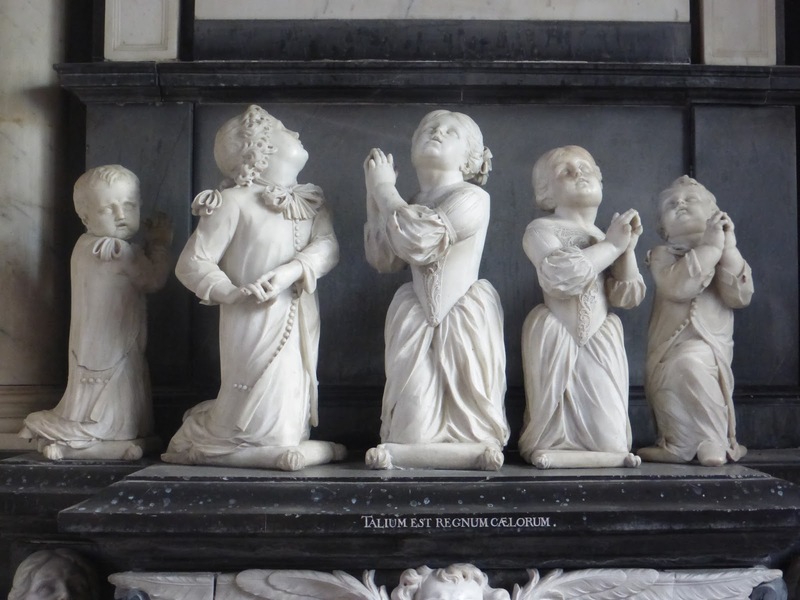 The sculptor has succeeded brilliantly in bringing life (paradoxically, of course, as they're all dead) to what could easily have been an uninteresting subject: several praying children in a line. 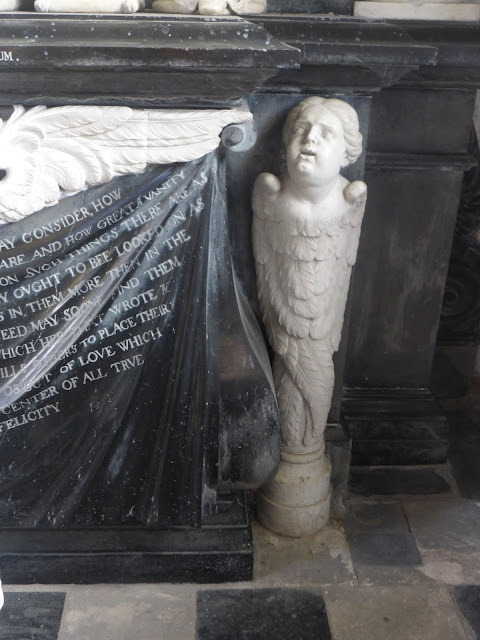 Compare what he's done with this subject matter to earlier depictions of the same, for example the 1605 monument to Mary Plomer at Radwell. On the other hand, while it's not easy to see most of their faces, they all seem to be similar, but this isn't surprising as they're siblings, and anyway the sculptor never saw them as they'd almost certainly have been long dead when the monument was made. Another animating feature is the expressive baroquely twisting poses of the children; notice for example that only Thomas holds his hands in the most natural way, in front of him - all the others are performing a kind of pirouette. 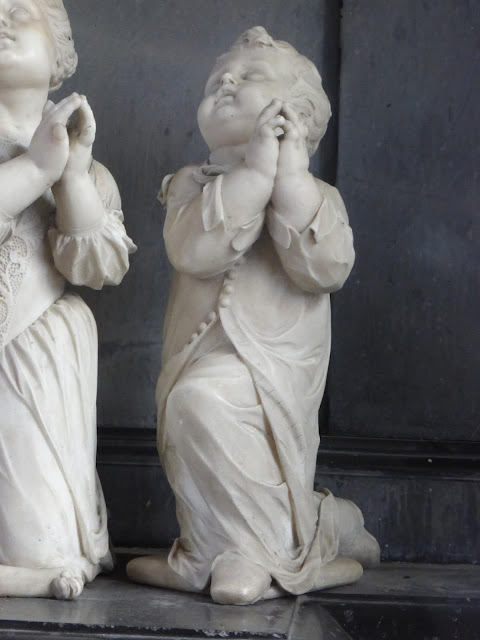 Even if the monument consisted only of the architectural framework and five praying children it would still be remarkable and deeply affecting. 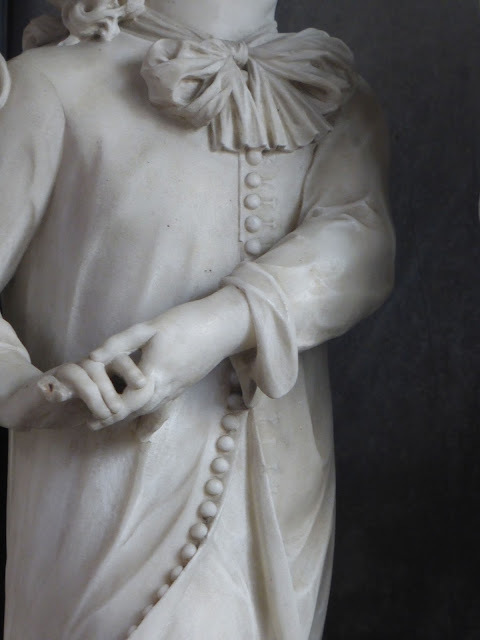 What elevates it to the status of a near-masterpiece is the sixth figure, an independent sculpture of the sole surviving daughter, Anne. 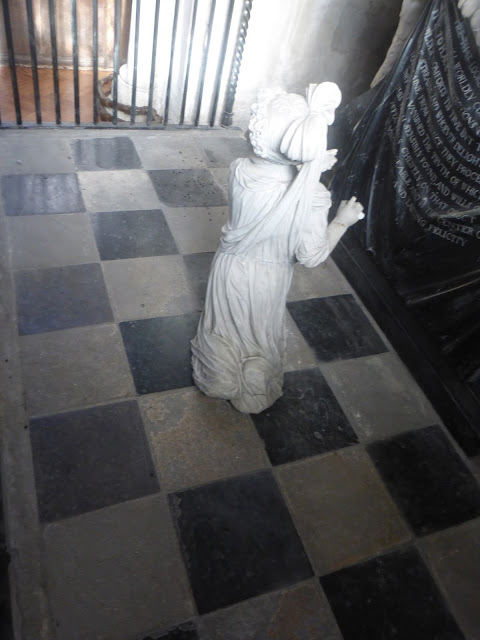 She is kneeling on the tiles in front of the monument with her back to the viewer, but twists her head around to make eye contact with us and gestures towards her late brothers and sisters. 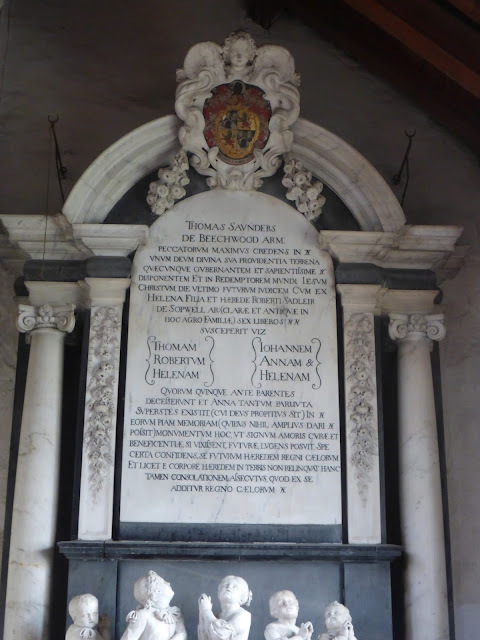 Anne was born April 27 1670; she married, firstly, Sir Edward Sebright, c.24 March 1687/88, with whom she had five children (one of whom, Edward (1698-1723), was apparently rather thrillingly 'killed by pirates'), and, secondly, Charles Lyttleton, after 1702. 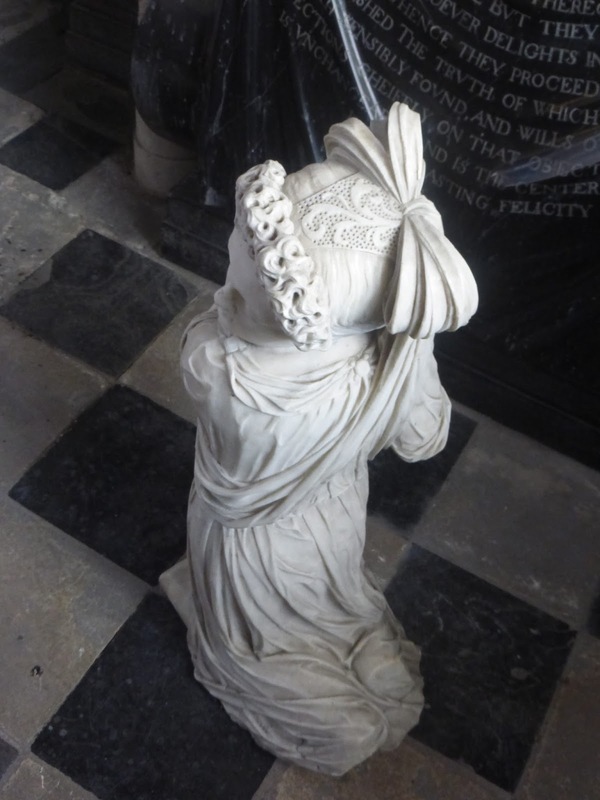 She died, aged 49, on Christmas Day 1719*****. 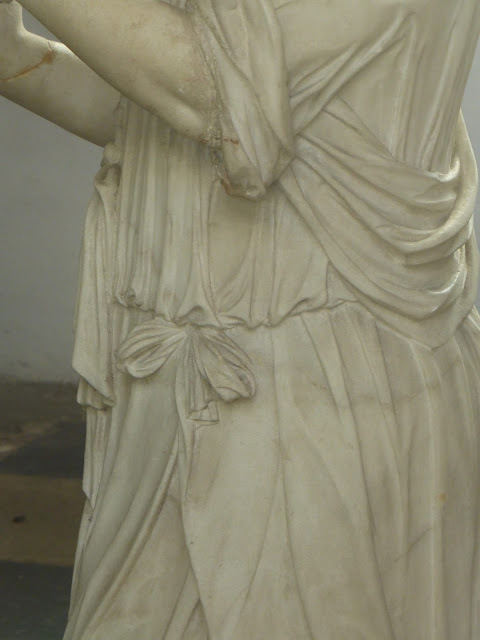 It's hard to gauge how old she is in the statue. My first thought is that she is a younger teenager. 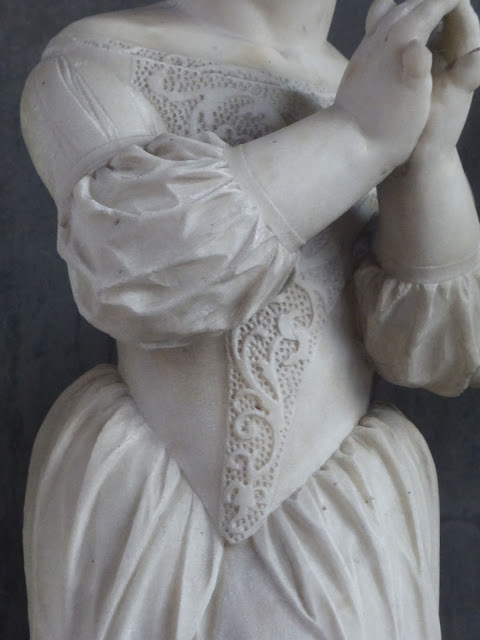 If the monument dates from c.1690 (but this is only a guess based on its style) she would have been about 20 when it was made, and it's possible that she is intended to be that age. However old she is, child or newly married young adult, she has a profoundly moving effect on us. Her expression is plain but tender; there's no obvious anguish in her demeanour, yet what a depth of feeling is implied. She implores us to join her in mourning for her lost siblings (most or even all of whom she could never have known), and how can we refuse such a direct, personal, heartfelt appeal. The living Anne is dressed in her burial shroud, while her dead siblings are wearing adults' clothes, even Thomas, who's barely a toddler. 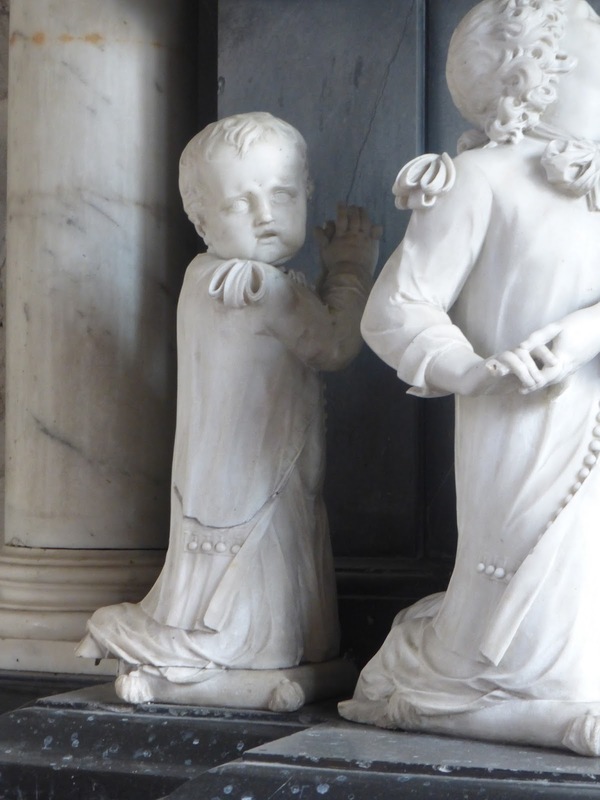 It was normal until the later 18th century for children to wear miniature adults' clothes, (though young boys generally wore what we'd now call dresses), but nevertheless the contrasting way in which the living and the dead are dressed is significant. Anne is dressed as if she's dead as a reminder to her, and us, of the fleetingness of existence; she is (if she's celebrating her marriage) starting a new life, but one day it will end. Thomas, Robert, Helen, Helena and John are dressed as if they're alive, because they are alive in Heaven, and as adults to bring home the tragedy of their early deaths and failure to reach adulthood. All the details are beautifully carved. The embroidered fronts of the dresses, and Anne's headdress, and the delicate, expressive fingers (some of which are unfortunately broken), are especially fine. So far I've referred only to 'the sculptor' without naming him, because we don't know for sure who he was. But in all probability he was William Stanton (1639-1705) (to whom the monument to Mary Markham, of 1673, in Ardeley church is also attributed), one of the largely unsung masters of English art******. The monument retains its original chequered black and white marble flooring and wrought iron railings; the latter have a slightly rustic elegance, but do detract from the overall effect by obstructing the view and making it look as if Anne is confined in a cage (and make the monument hard to photograph adequately). The monument is next to slightly better than average stained glass by Christopher Webb (I'm not a fan) of 1936; it washes the monument in coloured light on a sunny day, making the greeny-yellowy-gold of the points of the railings glow. 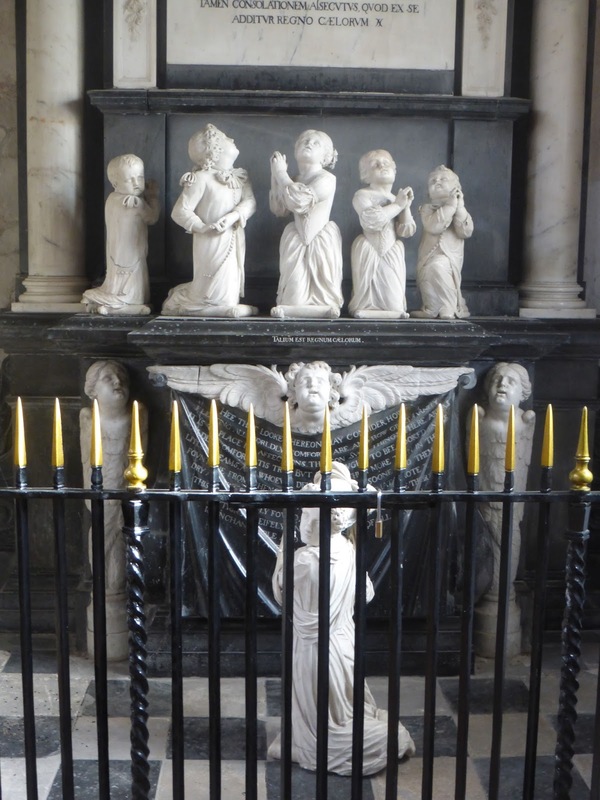 As I said at the outset, this monument is wonderfully and originally conceived; the presence of a free-standing sculpture to act as an intermediary between the viewer and the main monument shows Stanton was capable of genius. However, I've got two quibbles that prevent me from wholeheartedly hailing this work. Firstly, while I want to feel that the expression on Anne's face is powerfully expressive in its lack of obvious emotion, as if she's too numb to contemplate her overwhelming grief, I'm not sure that I can. Maybe her expression is just too neutral. I keep changing my mind on this - sometimes I think she's brilliantly understated, sometimes that she's a blank. Secondly, the figures (especially that of Anne herself) are simply too small. They're smaller than life-size (presumably a financial rather than an aesthetic decision), and you have to be close up for them to have any effect. Anne seems an insignificant thing relegated to the floor, if you notice her at all, until you're almost on top of her. 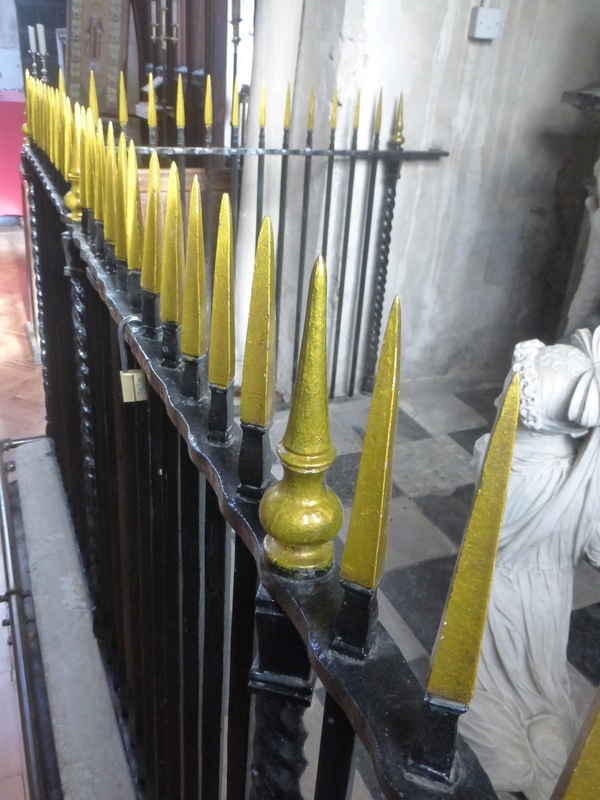 (The railings towering above her don't help.) Nevertheless, I stand by my assessment: it is (almost) a masterpiece. Ben Jonson his best piece of poetry." ** For all the genealogical information I'm indebted to the Geni.uk page about Dame Anne Sebright Lyttleton. 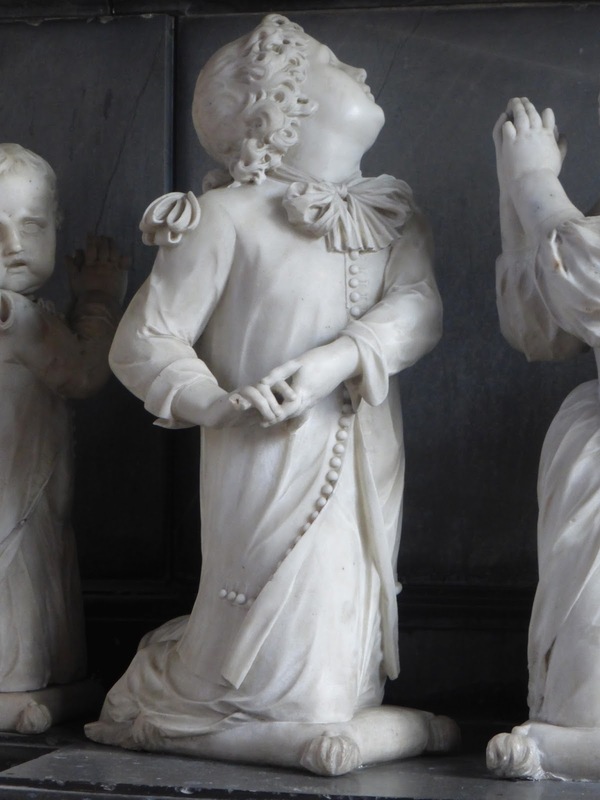 *** All six statues are free-standing and can therefore be easily rotated. If you look at old photographs (e.g. that by Edward Piper in the Shell Guide: Hertfordshire) you'll see that at times in the past the statues have been arranged slightly differently to how they are today. In Piper's photo Thomas and Anne aren't looking at a viewer standing in front of the monument, but somewhere off into the church's central aisle. This seems to me to diminish the monument's emotional impact. We can't know for certain how the sculptor intended the statues to be positioned, but I think their current placements are very likely to be correct. **** This phrase isn't mine (as you can tell as it's good); it's from Sir Thomas Browne's Hydriotaphia, Urne Buriall (1658). ***** Bafflingly, Geni.uk gives, as the cause of her death, 'Christmas'. ****** The attribution of the Flamstead monument seems to have first been made by Katharine Esdaile in a lecture in 1929. ******* Nearly all commentators since her follow her attribution. 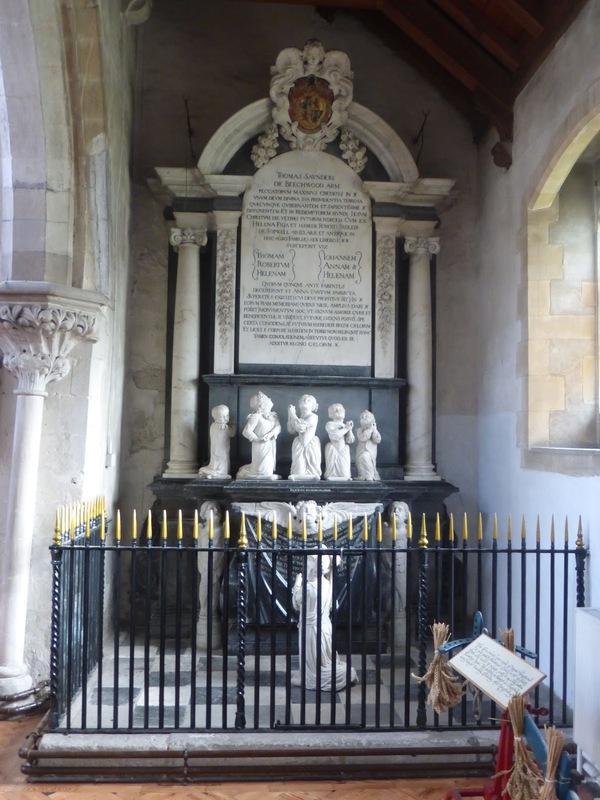 However, when I first visited Flamstead in 1993 there was on display a magazine article by Edmund Esdaile (the son of Katharine), who claimed that the monument is not by William Stanton, but that he and his mother had misattributed it to him on the strength of only a very brief viewing. Unfortunately I didn't note the name of the magazine. As far as I remember, the article didn't propose a different sculptor, and if it's not by Stanton it's hard to see who else could have made it. A very early work by Francis Bird (1667-1731)? I'll stick with Stanton. 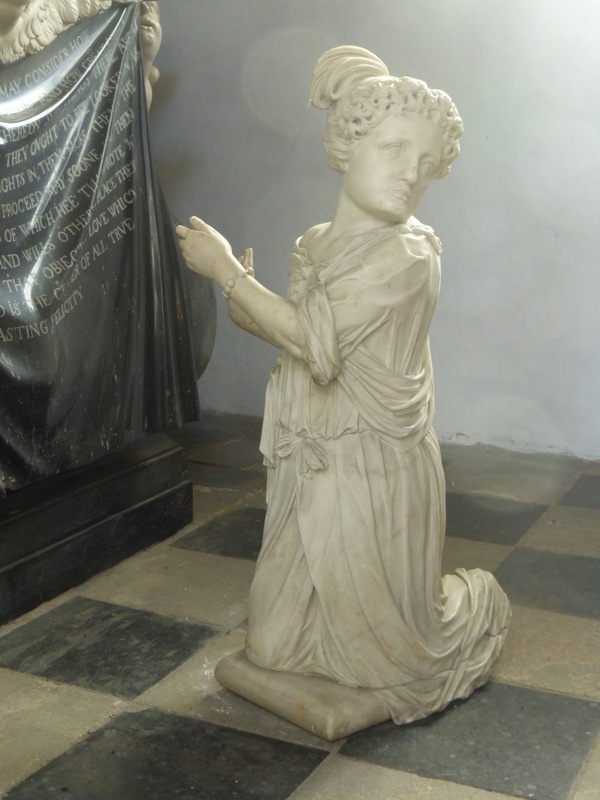 Mrs Esdaile also claims that the monument cost £1500, and again everyone has parroted this information, including Pevsner and the official listing. This strikes me as being a scarcely credible figure. 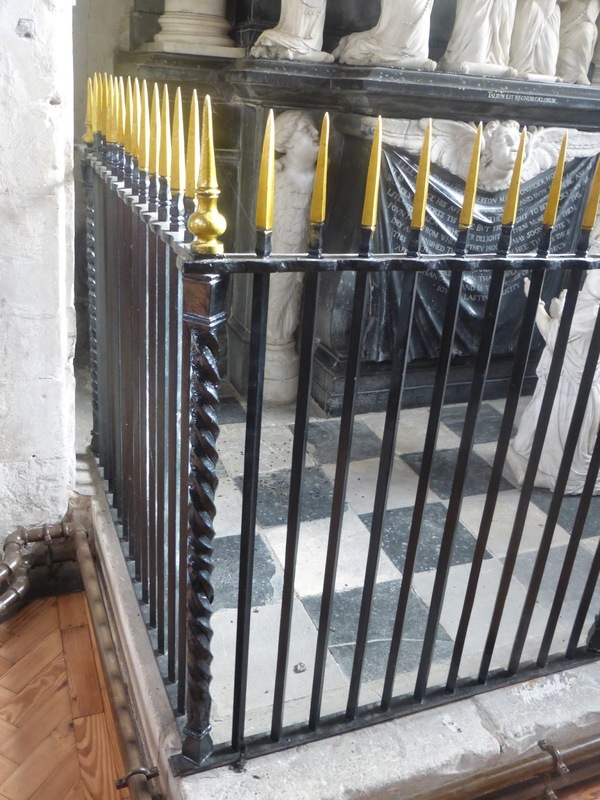 In the 1690s Sir Christopher Wren was being paid £200 per year as the architect of St Paul's. 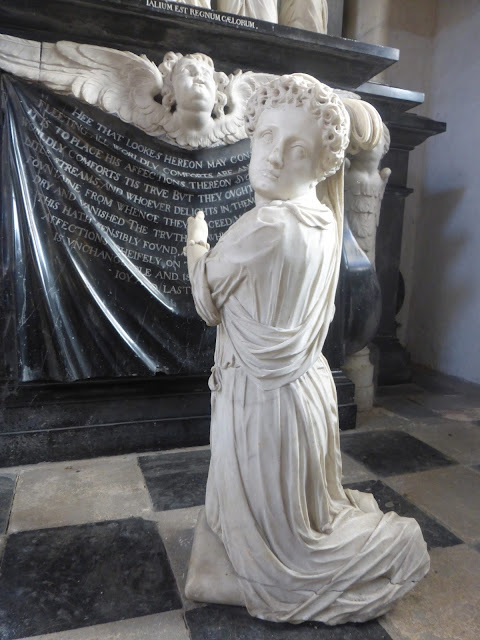 In 1679 William Stanton made the monument to Sir John and Lady Brownlow in Belton church, Lincs, a work comparable in complexity to the Saunders monument, for which he received £100. It's notoriously difficult to convert sums of money from centuries ago into modern day values, but this website (courtesy of the University of Wyoming) attempts to allow us to do so. According to their calculations, £1500 in 1690 would be worth almost $375,000 (nearly £300,000) today. Stanton can't possibly have been paid that much. Odder still, when you go back to Esdaile's original lecture (the reference to Flamstead is at the very end) she claims that the £1500 figure comes from Chauncy, that is, Sir Henry Chauncy, whose 1700 The Historical Antiquites of Hertfordshire remains an indispensable book (though he has to be treated with caution - he often mistranscribes sepulchral inscriptions, for example). I've checked my copy (of the 1826 reprint) and nowhere is the figure of £1500 mentioned. 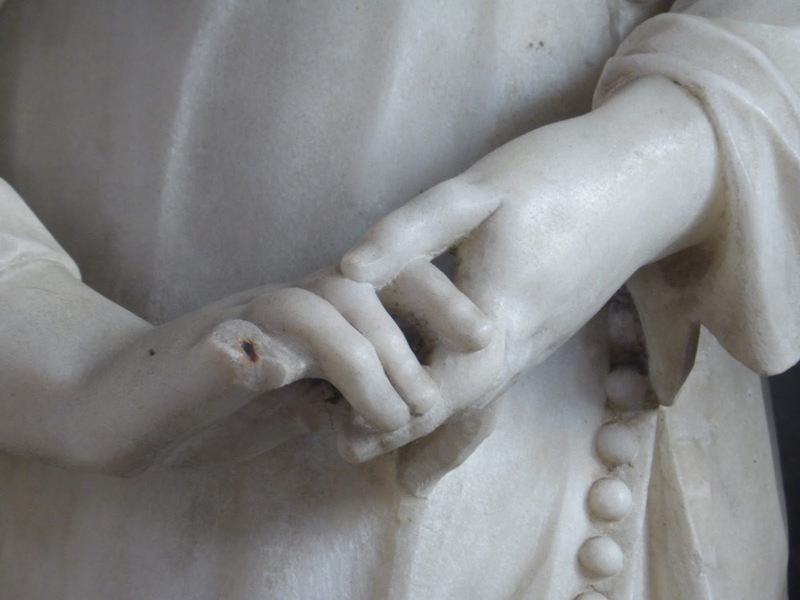 Chauncy was obviously very struck by the monument, as he devotes several paragraphs to describing it, but all he says about its cost is that it's 'a very rich and stately Monument, all of pure Italian Marble of several hundred Pounds Value'. There's a big difference between 'several hundred Pounds' (which sounds like admiring hyperbole anyway) and £1500. So where does the £1500 come from? This is anyone's guess. In 1929 Esdaile apparently plucks the figure out of the air, and in the early 50s Miss G Bondi, Pevsner's researcher, copies it into her notes on Hertfordshire buildings without checking the reference. Pevsner incorporates it into his book, and from then on it becomes sacred lore, appearing in reference books despite being a fantasy, and an obvious fantasy at that. 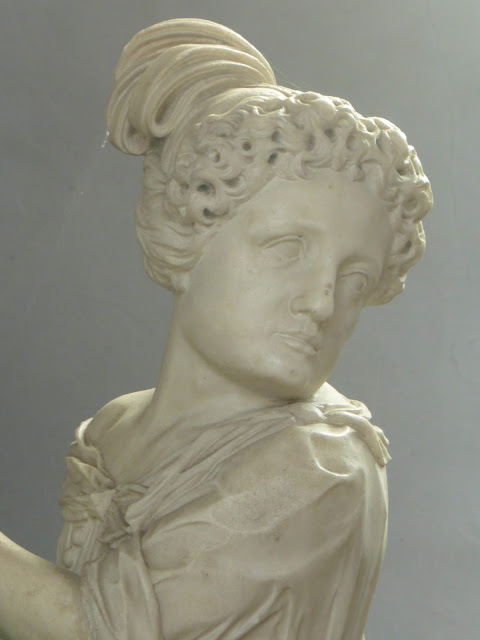 ******* Esdaile was among the first people to take English baroque sculpture from the later 17th and earlier 18th century seriously; previously it had generally been despised as ugly and barbarous. The Royal Commission on Ancient Monuments: Hertfordshire of 1910 doesn't even deign to mention the Saunders monument, although its remit was to list everything of note before 1700, and it does list an utterly routine Jacobean monument in the chancel.